Built around high-quality micro-sensor technology, the GX-2012 is Riken's smallest personal 5 sensor Gas Monitor with a built in sample Pump. 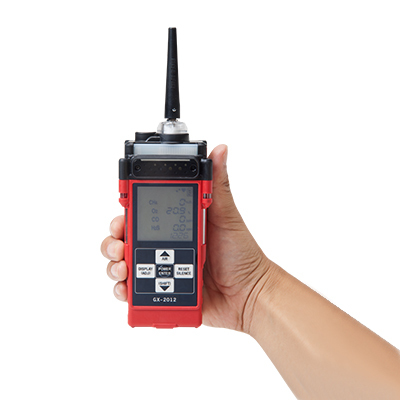 Weighing only 360g, two operating modes: Normal (for confined spaces) and Barhole.The GX-2012 can monitor the standard confined space gases (LEL Combustibles, Oxygen Content, Carbon Monoxide, and Hydrogen Sulfide), and it can also measure 100% Volume Methane and dynamically display either % LEL, or % Volume with its auto-ranging. The GX-2012 can be used for gas line purge testing as well as standard safety testing. A Single module calibration station for the GX-2012 and GX-2012GT portable gas monitors that can calibrate, bump test, charge, and archive data.